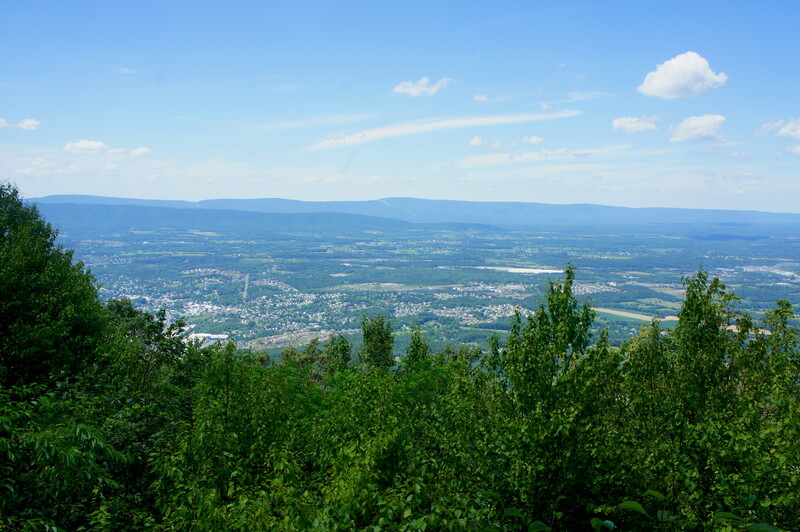 The northernmost promontory on lengthy Massanutten Mountain, Signal Knob provides sweeping views of Strasburg, Virginia and Shenandoah Valley. Climbing to the overlook, however, is a haul: hikers starting in the Elizabeth Furnace area of George Washington National Forest must conquer more than four miles one-way and 1,500 feet in elevation gain to reach the viewpoint—and those wishing to complete the counterclockwise loop back to the trailhead must endure a grueling, up-and-down 10.3 miles round-trip. Bring your hiking boots, as the trail crosses a number of thorny rock fields. 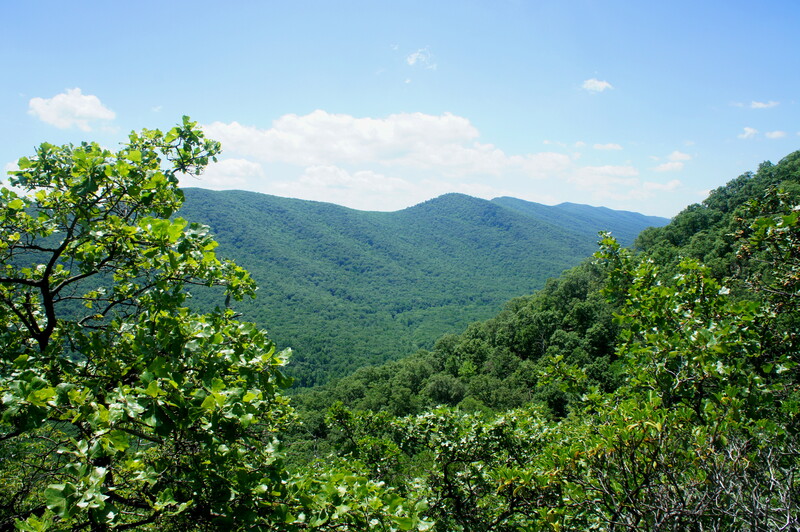 At the northeast end of Massanutten Mountain, Passage Creek slices the mountain in two, forming a short but scenic canyon that quickly opens up to Fort Valley. Hikers driving from Interstate 66 and Washington, DC will pass through this narrow gorge on Route 678 (a.k.a. Fort Valley Road), passing a handful of nice fishing and swimming holes. About 3.5 miles down Fort Valley Road from VA 55—beyond a set of hairpin bends—turn right at the sign marked “Massanutten Trail Signal Knob Parking.” (Note: If you reach the Elizabeth Furnace Campground and Picnic Area, you have gone too far.) The gravel turnoff leads immediately to a pair of parking lots; the hike begins at the far end of the north lot and will emerge from the trees 10.3 miles later at the far end of the south lot. Heading north on the Massanutten Trail, stop at the small information board for a basic map and description of the loop ahead. From here, the trail, under dense forest cover, bends westward and gradually climbs up a woody ravine, with the rocky terrain revealing itself right away. At 2/10 mile, the minor creek below comes into view, while the singletrack path passes behind a stone cabin on the left at ¼ mile. A few minutes later, cross the creek as the trail doubles back to the east and begins a steady climb up the mountainside. The Massanutten Trail crosses the first of several rock fields at ½ mile as the deciduous forest is gradually replaced with mountain laurel and Virginia pines. Always climbing, the path offers occasional but mostly obstructed views of the landscape to the east, but one of the first photo-worthy vistas comes at around 1.3 miles. 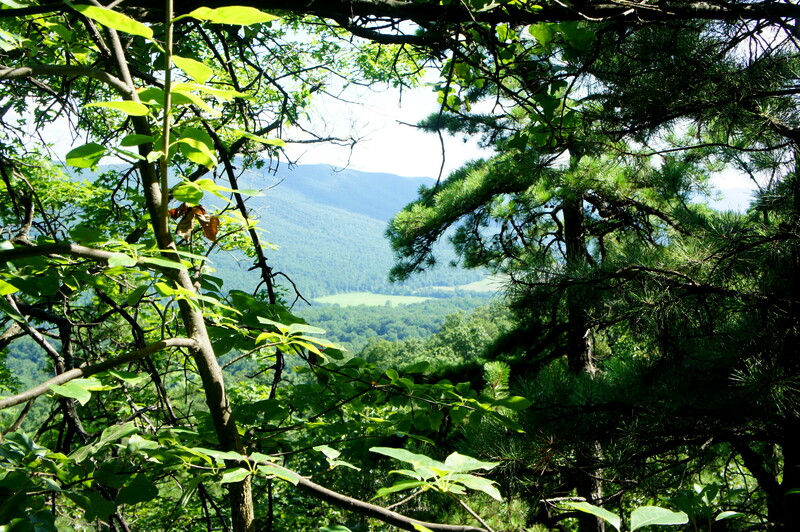 Here a break in the trees offers a look at Buzzard Rock across the wooded valley. 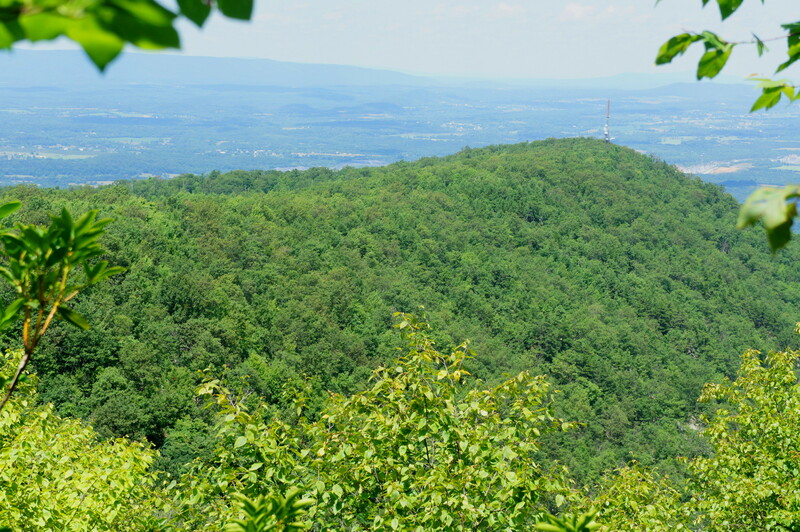 In fact, this spot offers a better view than the official Buzzard Rock Overlook 2/10 miles farther, where tree growth stands in the way of an unadulterated vista. Still it is possible from the overlook to see past Buzzard Rock to Shenandoah Valley and the Blue Ridge Mountains of Shenandoah National Park beyond. 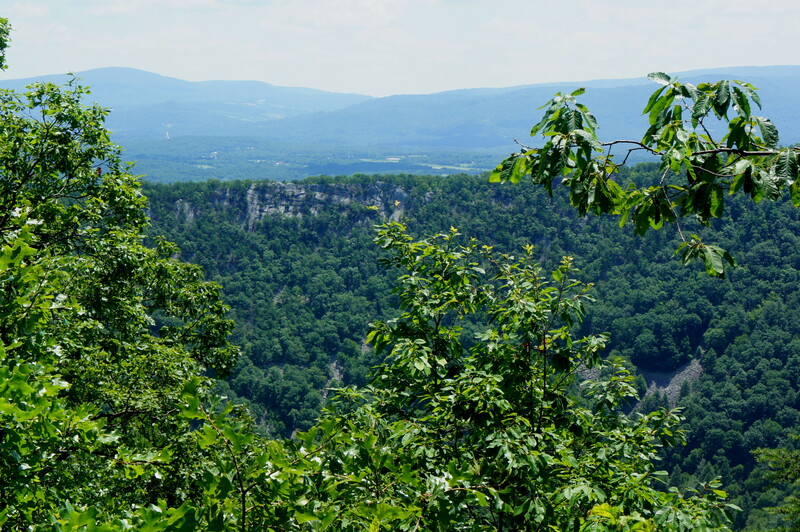 Buzzard Rock Overlook is situated at the end of a hairpin curve, and the trail beyond bears southwest. Pass a brushy ravine at 1.75 miles, then take a short break at Fort Valley Overlook at 2.1 miles. By now you have climbed around 1,000 feet, and your reward is a partly-obscured but beautiful view of Fort Valley to the southwest. 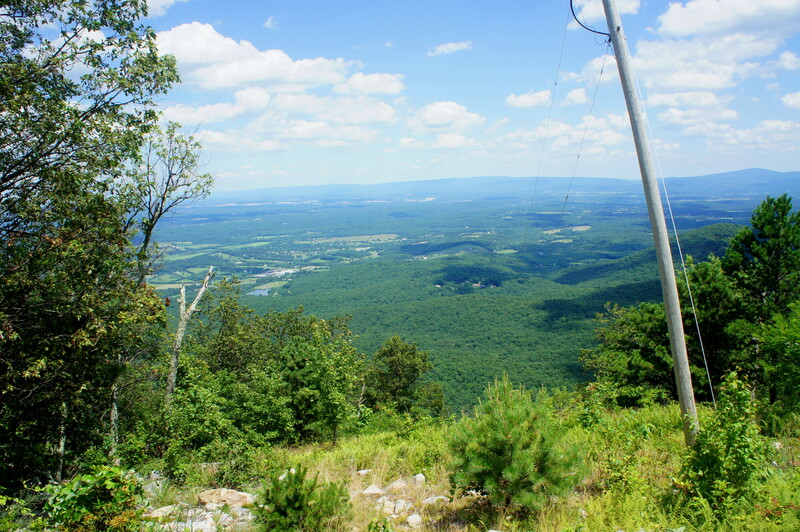 Views extend all the way to Duncan Knob and Strickler Knob, situated near the center of the Massanutten Mountain behemoth. 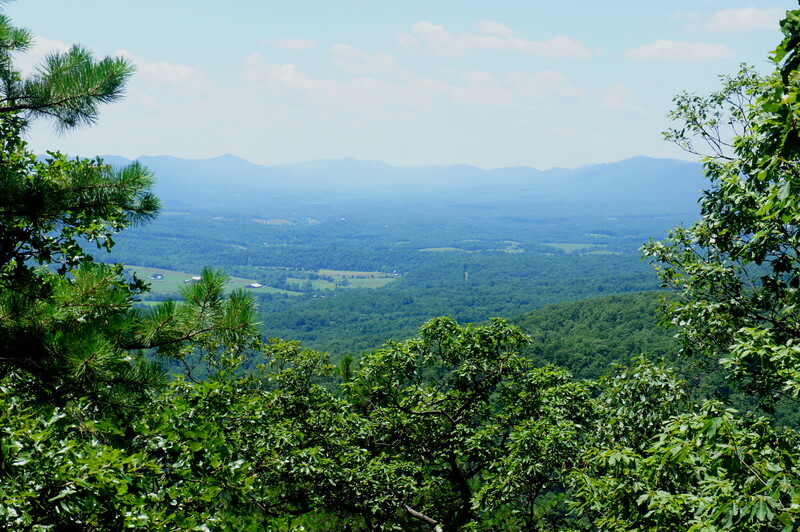 Following the footpath, you will reach the Signal Knob Overlook within a couple minutes. 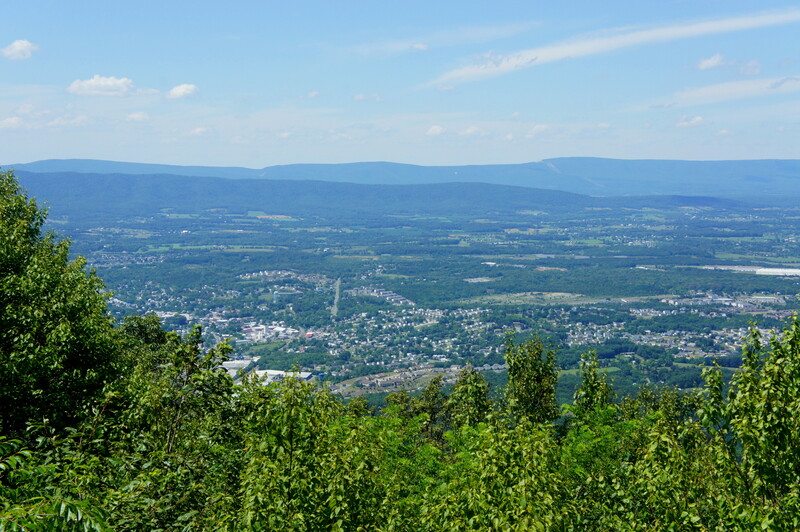 Small and surrounded by trees, the vantage point is partly obscured but nevertheless provides a nice view of Strasburg and Shenandoah Valley to the north, as well as views to Front Royal and the Blue Ridge Mountains to the east. Beyond Strasburg, Great North Mountain stretches off into the horizon, and on a clear day you can see as far as the panhandle of West Virginia. 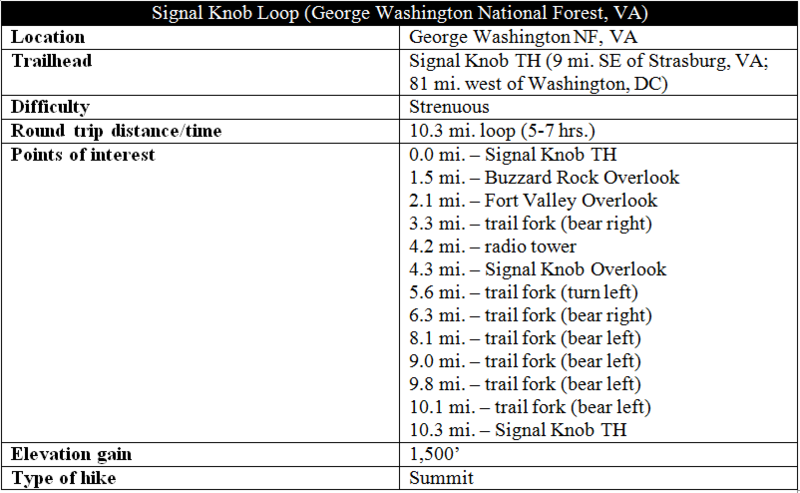 While having reached Signal Knob, the loop is not yet halfway done—a daunting thought that leads some to simply return the way they came for an 8.6-mile out-and-back (two miles shorter than the full circuit). 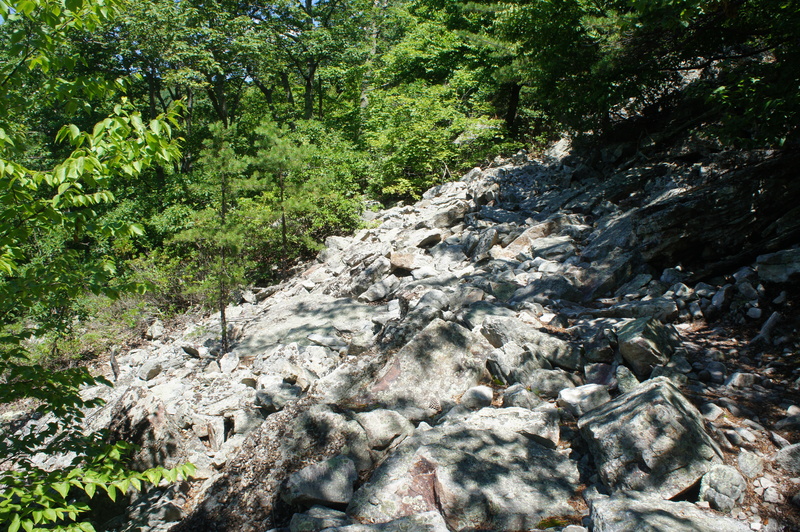 But hearty hikers can continue on from Signal Knob by following a thin singletrack as it skirts the north flank of the mountain. 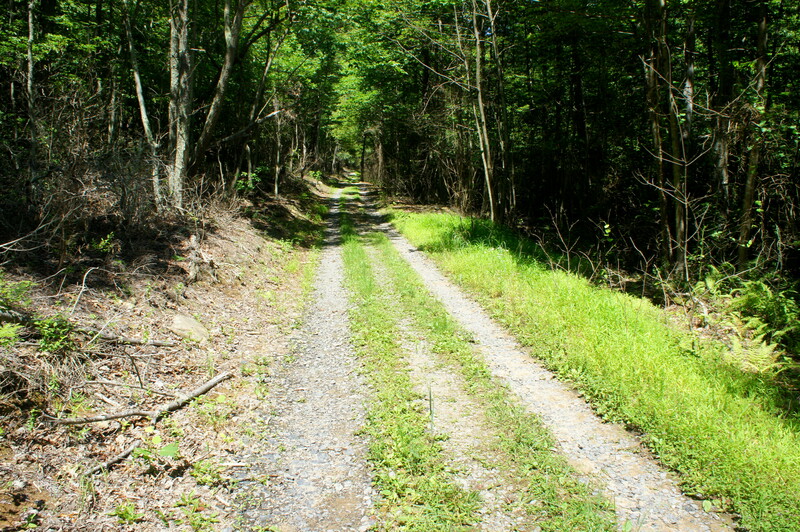 At 4.4 miles, emerge onto the gravel fire road again—this time take a right and follow the wide track down the hillside. The section that follows is exceedingly dull, following the road downhill into Little Fort Valley for 1.2 miles. Eventually Little Passage Creek emerges on the left, and the turnoff for the blue-blazed Tuscarora Trail emerges at 5.6 miles. 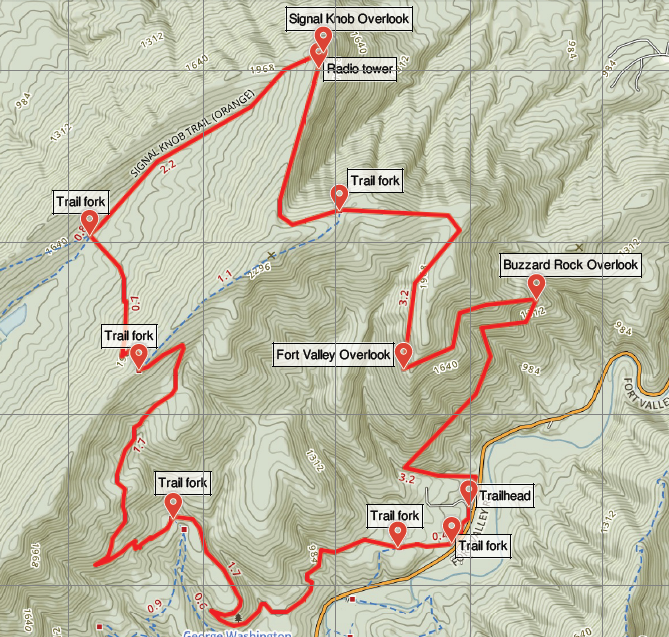 Turn left onto Tuscarora, immediately crossing the stream, then begin arguably the hike’s toughest climb. Not only does this grueling ascent of around 550 feet come more than halfway into the hike, it has some of the steepest inclines. 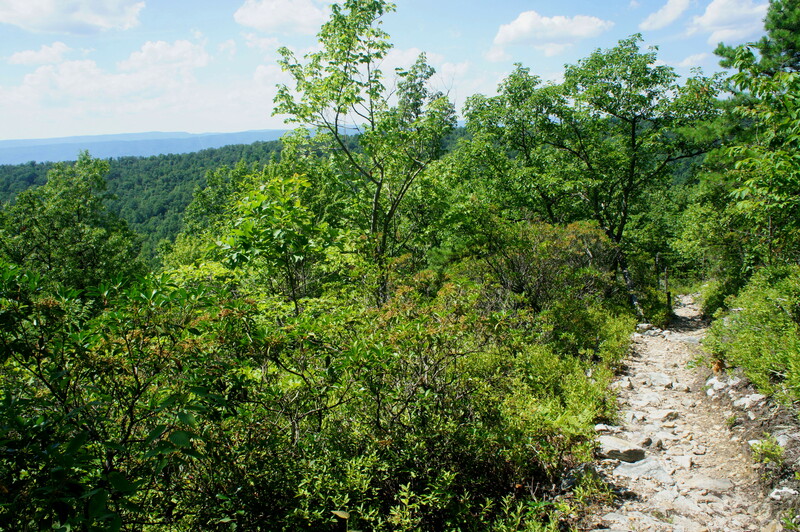 After a short switchback, the trail offers some solace at around six miles, where looking back over a patch of mountain laurel offers views over Three Top Mountain to the Great North Mountain range to the west. The trail clears another pair of switchbacks at 6.2 miles, then finally crests the top of the ridge—between Meneka Peak and Green Mountain—at 6.3 miles. Here the Tuscarora Trail meets the southern terminus of the Meneka Peak Trail; bear right at the fork. With four miles to go, the Tuscarora Trail begins its long and gradual descent to the trailhead. Hugging the ridgeline as it bears northeast, the now-faint path descends through a gnat-infested meadow with occasional views of Fort Valley. At 6.5 miles, the woods close in and the route—clear again, and well-trodden—rounds a switchback. For the next 1.1 miles, the trail makes its way southwest, cresting a small ridge at 7.25 miles, then cuts sharply east at 7.6 miles amid sporadic views of Fort Valley below. Everything this side of the high ridgetop is considered part of Bearwallow, a mostly shady expanse dominated by deciduous growth. Rocks also abound, nowhere more obvious than with the appearance of a giant boulder just before a short switchback at 7.8 miles. At 8.1 miles, the footpath reaches an unmarked junction with the pink-blazed Sidewinder Trail, which drops down a woody ravine on the right. Crossing a finger to the next ravine, the Tuscarora Trail turns south and gradually descends to about 1,100 feet, after which the route bends left abruptly and charts a course heading east toward the trailhead. At nine miles, the route passes a junction with a white-blazed spur trail and crosses a creek bed. Minutes later, you can now hear vehicle traffic on Fort Valley Road, but the trail is not yet done. Instead, the path stays relatively level, crossing another ravine at 9.5 miles, then climbs steeply uphill for a brief period. Gradually descending again, the Tuscarora Trail enters a bizarre section where the trail has obviously been rerouted; the path zigs and zags, repeatedly crossing what must have been the old track. (Note: This winding path is likely a concession to mountain bike riders.) At 9.8 miles, the trail reaches its penultimate fork—take a left, leaving the Tuscarora behind and returning to the Massanutten Trail. From here it’s an easy half-mile—stay left at the final junction at 10.1 miles—back to the Signal Knob parking area. This entry was posted in George Washington National Forest, Strenuous Hikes, Virginia and tagged Bearwallow, Buzzard Rock Overlook, Elizabeth Furnace, Fort Valley, Fort Valley Overlook, George Washington National Forest, Green Mountain, Little Fort Valley, loop hike, Massanutten Mountain, Massanutten Trail, Meneka Peak, Signal Knob, Three Top Mountain, Tuscarora Trail, Virginia. Bookmark the permalink.